Each winter, Bay Island Bonsai members demonstrate their knowledge by staging a memorable show, “An Exhibit of Fine Bonsai.” This book is a photographic essay of the displays presented at the 2011 Bay Island Bonsai exhibition. 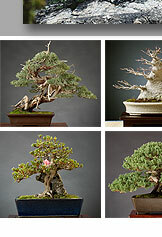 The Bay Island Bonsai's 2013 show book contains 86 photographs of fine bonsai and accent plants. This beautifully designed, 10x8 inch book is available in a hard cover with a dust jacket, or in a soft cover, and contains 92 richly-colored pages. Price: $54.49 (hard back). Click here.